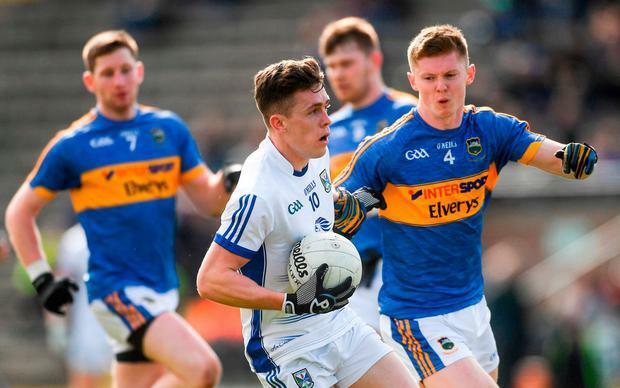 Cavan secured a quick return back to division one but only after a titanic struggle with 14 man Tipperary in front of 6,589 supporters in Kingspan Breffni. Mattie McGleenan’s men enjoyed the advantage of an extra man for much of the second half but struggled against a game Tipperary side who played some of their best football after Liam Casey was dismissed on a straight red card on 41 minutes. However a well worked goal from the excellent Liam McGrath kept Tipp’s noses in front for much of the second half though they will rue the point chances that feel to Jack Kennedy (twice) and Kevin O’Halloran when they game was on the line. Those misses kept the door open for Cavan and they drew level as the clocked ticked into injury time before sub Conor Madden kicked the winner to send the home supporters home happy and with a league final against Roscommon to come. The key score of the first half came when Tipperary goaled from the penalty spot on 14 minutes. Half back Jimmy Feehan was quickest to react to a breaking ball in the Cavan square and he was felled by a combination of recovering Cavan defenders. Conor Sweeney made no mistake to put the visitors 1-1 to 0-2 up. They would hold on to that lead until the short whistle. Cavan struggled in attack early on and needed 20 minutes to land their first from play through Ciaran Brady. Michael Quinlivan wasn’t exerting his usual influence but McGrath landed three first half points but Caomhin O’Reilly had the last say of the half with his fisted effort leaving the home side trailing by 1-5 to 0-6 at the break. Then came the sending off which left Tipp at a major disadvantage. They battled gamely and might have forced their way into the promotion picture but for those poor misses. Cavan will hardly care as they returned to the top flight at the first time of asking. SCORERS - Cavan: G McKiernan (3f), C O’Reilly (2f) 0-3 each, B Magee (2f), C Bradley, D McVeety, C Mackey (1f) 0-2 each, C Brady, C Madden, R Galligan (1f) 0-1 each. Tipperary: L McGrath 1-4 (2f), C Sweeney 1-1 (1-0 pen, 1f), L Casey 0-2, S O’Brien, J Keane, L Boland 0-1 each. Tipperary: E Comerford; A Campbell, E Moloney, J Meagher; B Maher, R Kiely, J Feehan; S O’Brien, L Casey; J Keane, J Kennedy, B Fox; C Sweeney, M Quinlivan, L McGrath SUBS: K Fahey for Maher (28), L Boland for Fahey (46), K O’Halloran for Kennedy (66), G Hannigan for Sweeney (70). Colm Keys Damien Comer is targeting a return in time for the Connacht final in mid June, if reigning champions Galway advance that far.